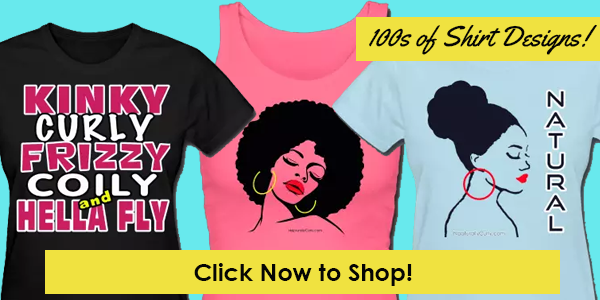 There is so much bad information circulating about black hair growth. I want to start by addressing the myth that black hair doesn’t grow. First of all, if that was the case people wouldn’t need relaxers every two months. So yes, our hair does grow, and it can even grow long. The problem is many people have trouble retaining length (breakage) — which is a big difference from not growing. I’ll talk about length retention later, but let’s go back to growing black hair. Everyone is always searching for that miracle product that will give them the long tresses they’ve always desired. But the truth is hair growth is largely determined by genetics. Look at the women in your family and see if you notice any kind of length pattern. Some people simply have genes that help their hair grow faster and longer than others. That’s definitely the case in my family. Many women on both my mom and dad’s side have longer hair, and my hair has always grown at a pretty good rate. Now, don’t get discouraged. Genetics aren’t the end all be all. It’s just something to keep in mind when you’re comparing your hair to someone else’s. Most products have very little impact on hair growth. Now unless you’re talking about a prescription product like Rogaine (for thinning and balding), most products do very little. A lot of what you see is just marketing. Now, of course everyone has an optimal growth rate, which can be inhibited by things like diet, stress, etc. and promoted by vitamins, exercise, and eating healthy. I discuss all that here. However, there are very few products that will make your hair grow faster than your optimal rate — which varies from person to person. If you’re looking for a natural remedy for thinning hair, try rubbing a small amount of castor oil into your scalp every night before bed. Castor oil is known to have a positive effect on thinning hair and is also used to thicken eyebrows. Keep in mind, though that if your hair is thinning from over-processing with a relaxer or traction alopecia (wearing braids too tight), rubbing castor oil is not going to help unless you stop what’s causing the problem. Here are more remedies for thinning hair. I don’t want to create unnecessary division by mentioning hair texture because I know this is often a touchy subject in our community. 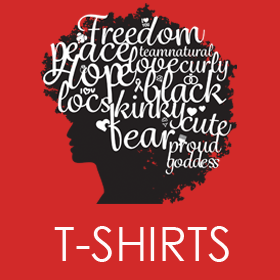 However, I felt it necessary to bring up here because like it or hate it, your hair’s texture and curl pattern definitely play a role in length retention because it affects your hair’s natural moisture level. What you eat can help your hair grow at its optimal rate, also make your hair stronger and prevent breakage so you maintain and gain length. I was experiencing some brittleness and couldn’t figure out what was going on. In fact, I had to cut a few inches because the breakage was starting to become noticeable. Turns out I was not getting enough nutrition. I have a bad habit of eating a lot of bad carbs/sugars, etc. and not enough fruits and vegetables. Well, that was starting to affect my hair. So I purchased a NutriBullet and began packing my body with vitamins and nutrients by drinking a “Nutriblast” (a smoothie made with fruits and veggies) 2-3 times a day. I also stopped eating so poorly, and after a few days I immediately noticed a difference in the strength of my hair when combing it. The brittleness stopped immediately. Don’t forget how food affects your hair strength and optimal growth rate. Protective styling does not help your hair grow any faster, but it helps you retain more length because you are not constantly manipulating your hair. The ends of your hair are the most fragile because they are the oldest part. So after all the combing, detangling, blow drying, and flat ironing, it’s very easy for your ends to become damaged. And if you don’t get your ends trimmed regularly, they will break off. So in order to keep your ends healthy, you have to continue to trim. 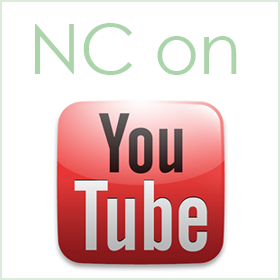 Check out my favorite shampoo and nighttime routine for healthy ends. The average person’s hair grows 1/2 inch per month, so if you are losing that amount or more due to breakage then it will appear as if your hair is not growing. 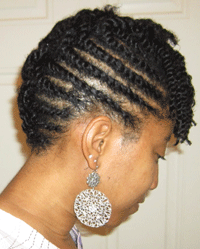 Protective styles like braids, twists, up dos or any style that tucks away your ends and doesn’t require manipulation can help you retain more length. 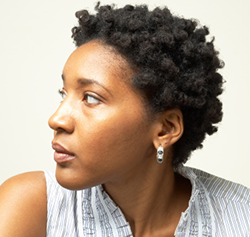 Also, natural hair is prone to snagging on clothing (especially wool) which can cause breakage and split ends, so keep that in mind during those cold months. 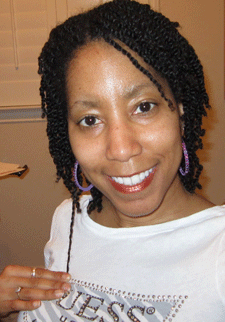 Here is an example of a protective style I wore while I transitioned to natural hair. Also remember that just because your hair is in a protective style (yes, extensions count too), don’t neglect to moisturize it. Because when you take it down, you will have a lot more breakage due to the fact your hair has dried out. Massaging your scalp for 20-30 minutes per day is a great habit to get into. It increases blood flow to the scalp area and can stimulate growth. This may be especially helpful if you have thinning edges from relaxers or weaves. If your hair is not permanently damaged, this could help your hair grow back. If you cannot sit and do the scalp massage all at once, do it several times per day in smaller intervals. I’ve also heard a lot of women claim natural hair grows faster than relaxed hair. This is not really true. Unless you have some kind of chemical damage from relaxers, your hair will grow at the same rate no matter if it’s relaxed or natural. 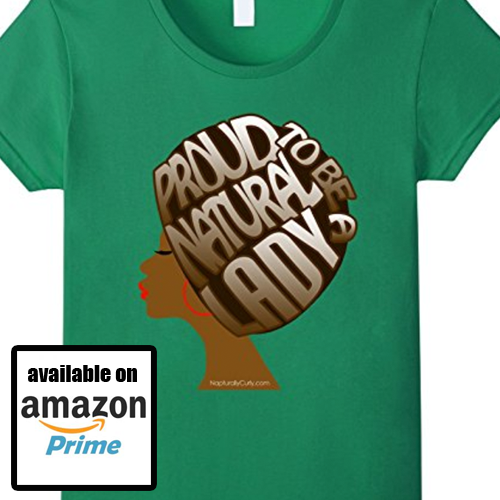 The reason why natural hair seems to grow longer is that a lot of naturals retain more length. Below is a picture of my hair 27 months after I started my natural hair journey. This is the longest my hair has ever been. And the length is not just about being natural (of course that helps ’cause my hair is stronger), but not using heat and wearing a lot of low-manipulation styles play a huge role in my length retention. 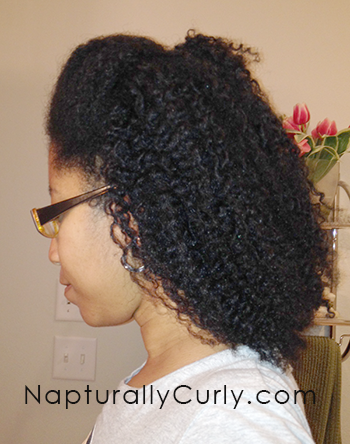 You can also see how much natural hair shrinks up. My hair is about 50% longer than it appears. That’s just something you have to deal with when you are natural. Here are some tips to help your edges grow back. What About The Length Plateau? Almost every natural experiences a time when it seems the hair stops growing. The reason this happens is your ends get older as your hair grows, and they break more easily. As a result, you never seem to get past that length plateau. Find out what the source of my plateau was. You may have the same issue. 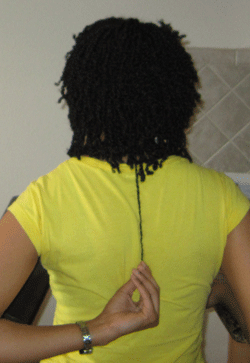 So I hope this article dispelled a few myths and shed some light on black hair growth. While protective styles, diet and exercise can definitely play a role in your individual optimal hair growth rate, don’t underestimate the genetic factor. This is not to say you cannot have long hair if you don’t have “the genes”, but it may require more patience and discipline (minimizing heat, eating healthy, constant moisture etc.) to achieve the length you desire. If you need more direct assistance with growing your hair longer and healthier, you might want to check out the book Grow it Long. 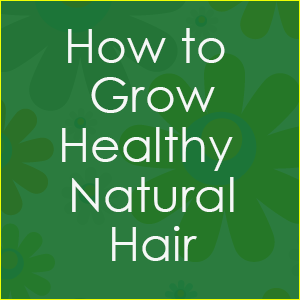 It’s a 96-page book (downloadable, PDF format) with tips on how to grow longer, healthier hair by using a more effective hair care routine. I already knew a lot of the information in the book, but my favorite part was the homemade recipes for scalp cleansing and conditioning. I love making my own products and will definitely be trying the brown sugar scrub soon! The author, Donna Hanover, also does a great job of explaining the different kinds of conditioners available on the market and when to use them. If you’ve struggled with growing hair all your life, this is definitely going to be the book for you. This is the kind of information our community needs and I was happy to support Donna. 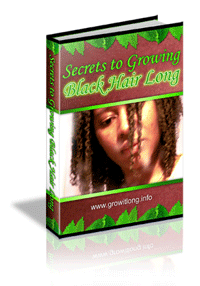 You can get Grow it Long here and download it today. I found a great hair oil for my natural hair. My hair was so dry and brittle- I mean hard! This oil is called the Beautiful oil of Faith . I bought it on Etsy. It saved my hair!! I am a 69 years old and trying to transition to natural hair. right now my problem is a greenish tint on my hair, which is down right ugly. how do I get rid of the tint permanently and continue with the transitioning. I used a black rinse on my hair a few weeks ago. now when I use the shea shampoo, conditioner or butter my hair look white a. I don’t think the strands are accepting the treatments. HELP. I want the transitioning to work and not perm any more. hello, the greenish tint may be due to to the base color that is in the semi permanent and/or permanent black hair color that you are using. I want to start taking care of my natural hair and would like to know products to buy and when/how to use them. Please can you help me with guidelines. I would moisturize/treat your hair more often than every two weeks. Even though you are wearing wigs and aren’t manipulating your hair, it still gets dry so when you shampoo it causes it to break. So I would try moisturizing your hair every 3-4 days. i hsve been using olive oil for some weeks now. Will it help grow my african hair? Hi Lisa i think i need help with my hair i have stop relaxing my hair about a year ago now truth being told i did not take goog care of my hair even though i buy everything in the market i still can not make it grow please help me to have a health hair it is very bad now it dry and breaks my friend just told me that my hair is 4c . Try hairfinity vitamins and argan oil hair mask once a week. Also I see my stylist once every ten days; use no heat in your hair….. you should see growth and health over 12 months Stick with regimen it will be worth it!! How can i grow my childhood hair back longer / because my ex boyfriend cut my hair and i believe he use it for some kind of spell, also i hear lard is good for your hair and is it ok to use lard on my hair while pressing to grow.i wash hair every 2weeks. I seriously have been trying to grow out my daughter’s 4c hair for the past 10 years, but no luck. I cannot get it pass 10 inches long, no matter what I do. I recently was advised to try scalp massage and I am doing that 2 or three times a week. Any suggestions? I keep her hair in protective styles and moisturize every chance I get, but I have to admit I’m not always consistent because of her school and dance schedules. She gets depressed that it won’t grow longer, and I’m at my wits end. my hair was growing but ever second i have to drim the ends,i change my diet,my only source of protein or fish vegetable and beans. I am in the secondbottle of nuhair rx product and I use it along with coconut oil. It is a mild yet very effective, adds instant volume to the hair after first wash itself. One of the great things is it doesn’t contain certain harmful chemicals used in other shampoos. Hi Taresa I cut of my hair because I want to have a natural hair , kindly regard please help me by sending me the tips of getting healthy hair style on my email : mafunantombozuko99@gmail.com. hi i cut my hair about 4 months ago it growing but the front is growing at a slower rate what can i do to help it grow faster? All hair grows at a different rate. My front grows slower than my back too. You can try massaging castor oil into your scalp at night. It will make it thicker but only thick to your natural thickness. If your hair is naturally thin, it may not make as much of a difference. But if your hair has thinned out from damage then it can. See a doctor. Are you having weight issues with this be it drastic gains or losses? Hormone imbalance can affect physical growth. Thanks a lot 4 d explanation. i’ve been wondering a lot abt my hair. its refusing 2 grow long, am sure its due to d genetics. am worried though. Yes…its truly accommodating. Nuhair rx which was I utilized 2 years before to make my hair sound. I had been used for 6 months. everybody saw the progressions on my head. Synthetic hair has chemicals in it to add shine. Next time, soak your hair in vinegar and water prior to using to rinse that chemical off. Buy some castor oil and massage it into your scalp nightly. Sounds like you had an allergic reaction to the chemical they use. Hi my hair used to be down my back, but i had to cut it all off due to bacteria infection. Now im all natural and i have been using as i am products and i used to use hair growth oil which works wonders but is a bit exspensive. What can i do to help my hair grow. i have a straight natural hair, what can i do to have a natural curly hair. Am so in love with natural curly hair. Also can i do same for my baby? Wow…Look like natural hair shrinks up a lot..more than what I thought. Liked your hair and I must admit that you have maintained it very well, great job! It’s great for sealing moisture in. But I would only use it in the summer because it can make your hair hard because it hardens in colder months. Hi, I’m thinking of going natural after using a relaxer that has burnt my front and sides. can you help? I am 54 years old and my hair is thining out. At night what type of covering do I use after applying the castor oil. I have ordinary castor oil. Castor oil is better for thickening the hair. Hello! I enjoyed reading this blog. I have serious breakage and I think I have heat damage as well. I’ve been natural almost 2 years. My hair is thin and very fragile. It just barely falls below my chin and I did the big chop in Oct 2014. I will be honest I don’t care for my hair the way I should, it’s under a hat or a wrap of some kind most of the time. I don’t have a lot of time to dedicate to my hair and I don’t know what to do. What do you suggest I do that won’t take a bunch a time everyday to get my hair to a healthy state.? Thanks !!! Massage castor oil into your scalp nightly. My natural hair used to be always full and long.I have never applied relaxer on it.I just stretch the hair.But now my hair is breaking.Especially my front hair.What can i do to it,please? I cut all my hair off on May 7th because most of it was damaged and dry what should I use for it now.? Hi, my hair is chemically damaged and I am transitioning from perm, what moisturizers can I use? I am in the same boat I have been natural since August and started with short hair and progressed to longer hair. However, I was doing bantu knot outs and twist outs, plus I began with relaxed hair and I guess had a serious line of demarcation. Long story short, as of two days ago, I noticed my hair being thinner and very brittle. I had a decision to make–cut or do not cut. so I cut my permed ends off and now back to short; however, I decided to roll with magnetic roller sets, deep conditioning every other day, using a blend of oils my husband made for my 4 b hair. so far, my air has regained some elasticity and I think from here on out, it can only get better. So, to sum it up, choose a way to style your that is healthy for your hair–so far, my money is on magnetic roller sets, deep condition until your hair is repaired and if needed, trim your hair—I hope this helps. Shea Moisture moisturizers are great for dry, damaged hair. 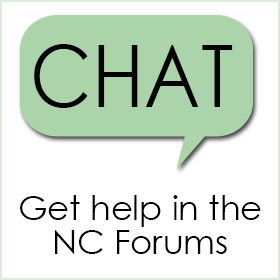 Look for products on shelves that specifically say for chemically damaged or brittle hair. I’m just starting out with the transitioning process. I’m currently 2 months post relaxer, my hair is dry, damaged, thick, and shedds a lot. what products do you recommend that should I try that can help me with the long journey ahead? Get a protective hair style, silk scarves and spray on JCS leave in conditioner daily. Moisture is key but only if you lock it in. Use shampoos after conditioners but only periodically. You can cowash all the time. Don’t manipulate often, or use combs brushes. I just took box braid out and I use the above products the whole time. There was very little shedding and I finger combed every inch of hair, patiently, tenderly. I have fine 4c dense hair. So enjoying being natural. Ive notice since i started taken biotin everyday and applying argan oil theres been a bit of a difference. I put the argan oil on everyday and wet my hair before brushing (which causes very little breakage ive notice.) My hair seems to be loving it. I also use a jamican black castor oil and pepermint mix lotion. My hair loves it. I can feel the difference in it. And my curls are getting more defined. I’m tellin you Hope, that Jamaican Black Castor Oil is really the truth! I hear nothing but great things. Thanks for sharing. I have a pretty decent general length, probably to the small of my back if I flat iron a bit. Type 4a, 4b probably. I’m not much for hair maintenance, so a wash, generous application of blue magic super sure grow, flat iron and twist once a month is all I’m really up for. The problem I’m noticing though is that I have almost two different textures going on now. The hair above my ears, all around to the front, the hairline coast I guess, is becoming super brittle. I’m noticing now that this band of hair is half the length of the rest of my head. I wouldn’t mind except now I have a ponytail with twists on my back and a kind of front line bangs going on. The frontline hair is brittle to touch, every wash and finger comb, hair from this area makes up like 50% or more of the hair I lose. How do I grow this back? A head scarf or something? Massage castor oil into those thin spots before bed. The reason I say before bed is your body restores/heals itself overnight and the product can work. Castor oil is great for thinning hair. Just make sure you buy the pure version from the health store and not the ones from the pharmacy that are mixed with other things. I have been getting a relaxer every month I get a new sew in. It’s gotten thinner and short I want my thickness back ! Help me please. First give your hair a break from the relaxer and sew-ins. The sew-ins are creating tension and relaxing every month is too often. You should try to go at least 2 months. Next, once you give your hair a break from sew-ins, massage castor oil in your scalp before bed. But until you stop putting stress on your hair, your thinning won’t improve. It has to be a combo of less tension AND the castor oil. Be careful, too much tension over time can cause alopecia and your hair won’t grow back. Hi Rehanna. Your hair has to be growing. More than likely it’s just breaking off. Are you moisturizing your hair regularly? Does it appear to be breaking more? I am starting my transition from chemical to natural. I cut my hair short on the sides and back and long on top. my hair is thick but a natural wave pattern. I don’t even know where to start to get it soft and growing. Hello Lisa, I just took out crochet braids about 2wks now and my hair has grow at lot oh I been natural for 1-1/2yrs now, I really can’t do my own hair I’m taking a break from crochet braids because of dryness, what is the best way to keep it moist while in braids? Make a spray with water and some drops of your favorite oils. Or use any water based light moisturizer. If it’s too thick it will leave residue. This will frizz your hair a bit but it’s worth it for the health. You can also tie your hair down to prevent fly away a when its damp. Use this about once every 2-3 days. I’ve been wearing sew in hair for 2yrs. No chemicals so for 3yrs I cut it off it’s grown about 8 inches nice length. .I’ve been wearing it straight and flat ironing it twice a week. and rolling it with rods but don’t want to damage it don’t want to put chemicals in my hair any more how can healthy. I’m thinking about dying my natural hair. Should I start using an anti-breakage line ? Because I know that colored hair require extra moisturizing and break very easily. I totally agree with Yolanda J, I have been using it as well and it has done wonders for my scalp and hair. Your healthy hair growth journey begins with a healthy scalp. Curl Again Rosemary Mint Citrus Hair and Scalp balm is the way to go.